Whereas in previous years I believe the Route 351 Meadowlands Express Bus Service was half run by NJ Transit and half contracted out, this year it will be completely run by CoachUSA. The 351 bus takes you from the Port Authority Bus Terminal in midtown Manhattan to the Meadowlands Sports Complex for major events. It’s $5 each way, exact change required. And many people love to take this bus to Giants and Jets NFL football games. Sure, some people have defected to the train, but the 351 has its true believers. The Long Island Rail Road recently made two notable improvements to its “Take the Train to the Game” Meadowlands Rail program. First, it changed its joint LIRR/NJT ticketing policy. Second, it added excellent schedule information to its website. The original joint LIRR/NJT ticketing policy was that such tickets could only be used on football game days, and not on days for which rail service was running to the Meadowlands for any other event or reason. That policy has now been changed to allow the LIRR/NJT joint tickets to also be used for a limited number of non-football events. 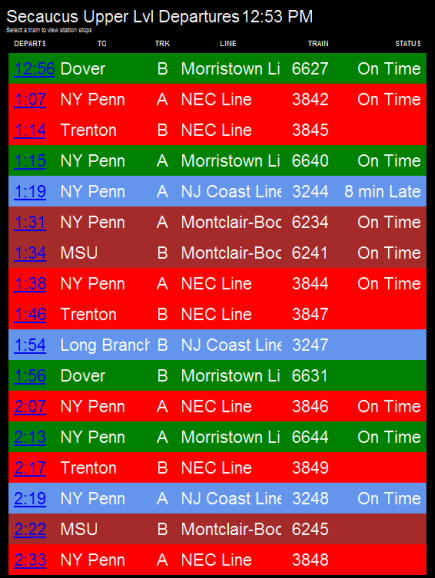 This is likely a result of the the huge lines seen at the NJT ticket machines in Penn Station before the U2 concerts, and should help to reduce those lines in the future. 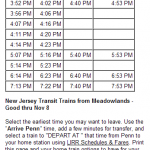 The LIRR has also done what NJT should have done from the beginning – publish a simple one-page schedule of all the trains to and from the Meadowlands. 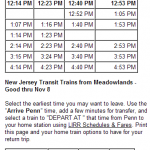 The LIRR now allows you to click on the game time of the football game you are traveling to, and then they present you with a table of trains times for traveling between Penn Station and the Meadowlands Sports Complex station. This is a huge help for people trying to understand how often the trains run, how long the rides and transfers take, and what their options are for getting home from the game. Bravo LIRR! Click the links below to see the game time timetables, or look at the screen shots below them. MTA officials were too busy tailgating with NJ Transit officials at Penn Station New York today to notice the significant and glaring error in their all important press release. The press release, meant to announce the beginning of both LIRR/MNCR+NJT joint-ticketing to the Meadowlands and direct Metro-North New Haven line service to Secaucus, is only successful with the former. 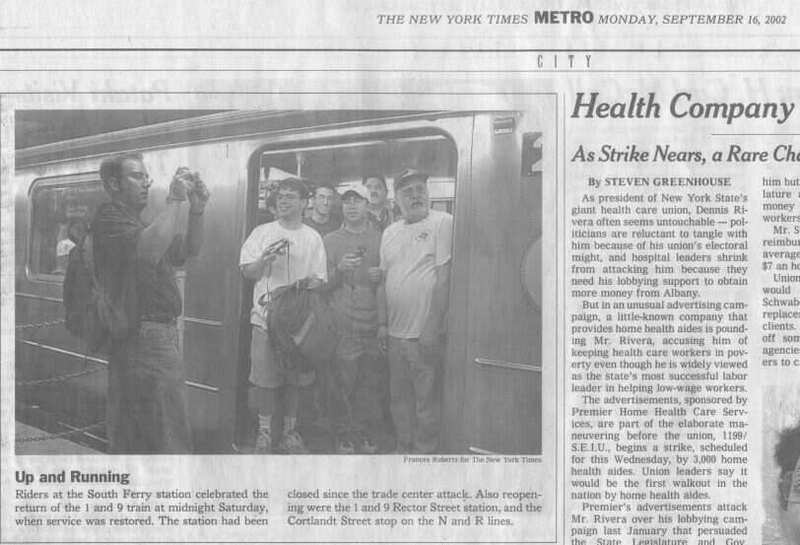 That’s because the press release GOT THE DATE WRONG of the first direct New Haven line train!!!! Good job, MTA. Way to go. You see, the 9/13/2009 game actually starts at 4:15 PM, thus making it ineligible for direct New Haven line service. The correct start date of direct New Haven line service is Sunday, September 20, 2009, when the New York Jets host the New England Patriots with a 1:00 PM kickoff. In case the MTA goes and corrects the press release, below is a screen shot with the offending material highlighted. 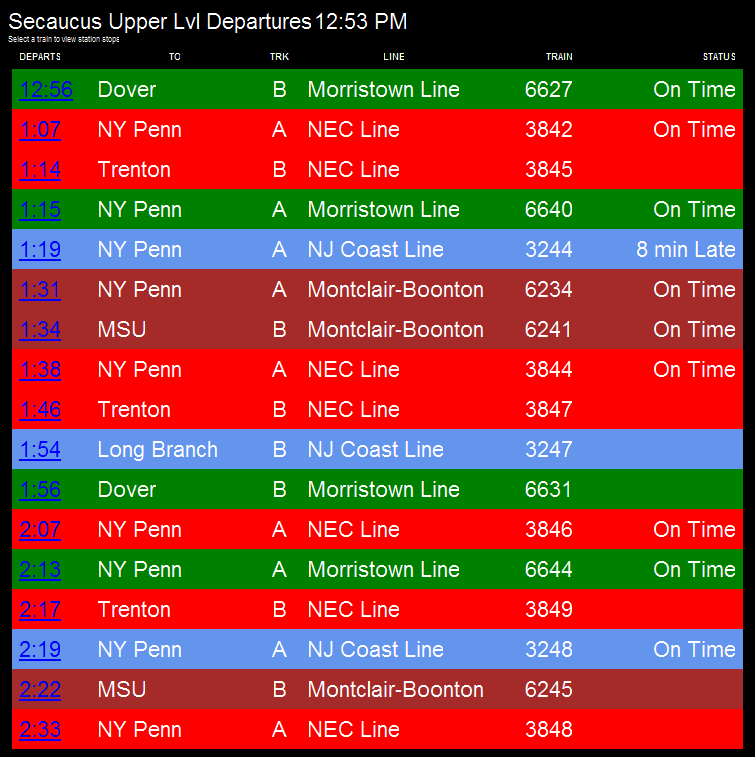 New Jersey Transit has announced the trial implementation of real-time train arrival / departure boards available to mobile-internet users for the Secaucus Junction train station. It is being called DepartureVision™. 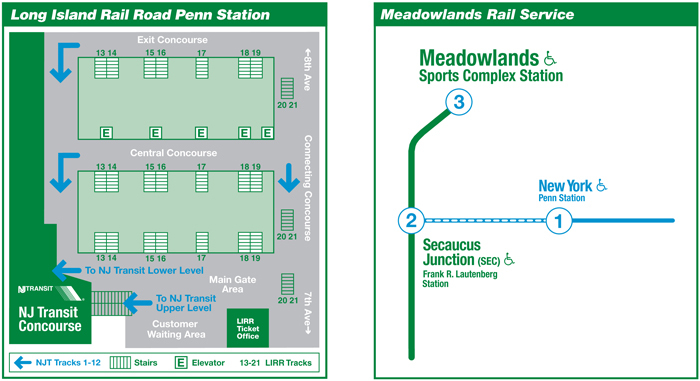 Customers who use the new Meadowlands Rail Line to travel to and from football games or major events will be able to check their Secaucus connections from Giants Stadium. To see a large screen shot of what DepartureVision looks like, click the image below. For much more information about this great new service, read the Customer Notice. I hope this trial is very successful, and leads to DepartureVision being made available for all train stations in the New Jersey Transit rail system. You can now buy and use a single train ticket to ride from stations on the Long Island Rail Road all the way to the Meadowlands Sports Complex in New Jersey, home of Giants Stadium, a new football stadium to be named later, and the Izod Center (as well as the Meadowlands Racetrack and the unfinished Xanadu). But be careful – even though New Jersey Transit will be running trains to the Meadowlands for events other than Giants and Jets football games, the LIRR thru-tickets are only “officially” valid for football game days. This may have something to do with the fact that, as the LIRR notes, you must show your rail ticket at the fare gates at Secaucus Junction, instead of feeding it through the turnstile, since the LIRR ticket stock does not have the magnetic stripe like the NJT ticket stock. Oh, and Metro-North is doing the same thing. 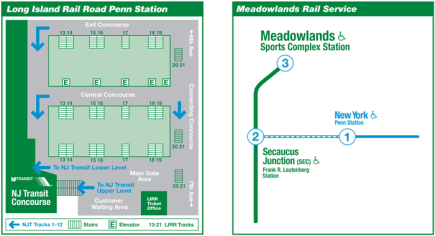 Even though they are running direct trains from the New Haven line to Secaucus Junction on the days of Sunday 1 PM games, you can also buy a joint ticket from any Metro-North station that you can use to get all the way to the Meadowlands. You will of course need to get from Grand Central Terminal to Penn Station New York in order to board a New Jersey Transit train to Secaucus. The brochure linked to in my recent post on this topic explains things in much much greater detail. P.S. 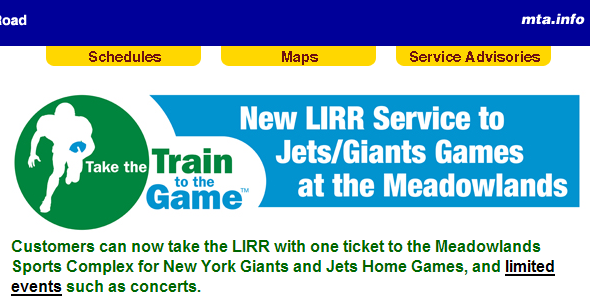 And no, you can’t buy an LIRR ticket from Penn Station New York to the Meadowlands. I know, because I tried it this evening. Would have been (pointlessly) cool though, in a railfanning kind of way. Update: Here’s a good Newsday article on the topic of the joint-ticketing. Edit: This brochure, in all its glossy printed glory, is available in the information boxes next to each of the upper level tracks at Grand Central Terminal, as of yesterday, August 19, 2009. NJ Transit, the New Jersey Sports & Exposition Authority, and the Port Authority of NY & NJ hosted an inaugural ride to the opening ceremony of the new Meadowlands Rail Station today. The inaugural train departed Hoboken at 1:25 PM, then departed Secaucus a few minutes late at about 1:45 PM, and arrived at the new Meadowlands station at 2:00 PM. Below are many of the photos I took during the day. Click on the thumbnail image to view the full size photograph. Governor Jon S. Corzine, New York Jets owner Woody Johnson, and New York Giants co-owner John Mara rode the train from Secaucus (as far as I can tell, because I didn’t see them board at Hoboken) and then spoke at the opening ceremony after. Various other politicians and officials were also present. After the speeches, Governor Corzine cut the ribbon, symbolically opening the station for service. The station itself is basic but nice. Some people would like to see the line loop around the sports complex, but for now it unceremoniously dead ends. At 3:00 PM, the inaugural train returned to Secaucus and Hoboken. Revenue service to the Meadowlands Rail Station begins this Sunday for the CONCACAF Gold Cup Final match at 3:00 PM at Giants Stadium. The first train leaves Hoboken at 11:30 AM. A ribbon cutting ceremony and inaugural train ride to the new NJ Transit Meadowlands Rail Station is taking place today. An article in The Star-Ledger has revealed that New Jersey Transit’s train service to the new station at the Meadowlands Sports Complex will begin on Sunday, July 26, 2009, for the CONCACAF Gold Cup Final match. Lastly, the Giants invited us to a screening of “The Taking of Pelham 1 2 3” at their practice facility this afternoon with about 40 of the players. The film, which comes out June 12, was co-produced by Giants co-owner Steve Tisch. 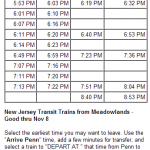 Following last month’s release of Meadowlands Station rail service information by the MTA, New Jersey Transit has now posted information of its own. As was also mentioned in recent news articles, the NJT webpage announces that service will begin in June 2009 for special events and that a season-long NJT travel pass called the “GAMEDAY PASS” will be available for $110. Additionally, NJT introduces us to the idea that Rail-GatingTM is the New Tail-Gating.